1. Turn on the eye tracker monitor by pressing the Standby button on the left side of the monitor. 2. Turn on the eye tracker server by pressing the power button on the back of the unit. See picture right. When the power is on a blue LED will shine. 3. When you have finished collecting gaze data, turn off the eye tracker server by pressing the power button. The blue LED will be off when the eye tracker is powered down. Please make sure the blue LED is off before you leave the room. 4. Log in to the computer using your onepurdue career account, e.g. onepurduecareeraccnt. You MUST include the onepurdue part or the user environment for the eye tracker software will not work properly. 5. Launch the Tobii Studio software via the elevated shortcut: Start >> All Programs >> 0 Tobii Studio Full Feature. Use only this shortcut or you will not have full software functionality. 6. Be aware that Tobii Studio software settings are not saved on exit. Make any desired changes to the data collection and calibration settings under Tools >> Settings. 7. Gaze data project files may not be remain on the hard drive of the eye tracker computer between reservations. During collection of gaze data, files are saved to the computer hard drive. After data collection is completed for a session, a project file archive must be exported and saved to an external drive (provided by the user). After export, the original project file on the computer hard drive must be deleted or other users will be able to access your data. The project file archive can be imported from your external drive onto the computer hard drive during a subsequent session. Instructions for project file management are found here. A printed copy of these instructions is on the eye tracker table. 8. Correct positioning of the eye tracker with respect to the participant’s eyes is a critical step for calibration. 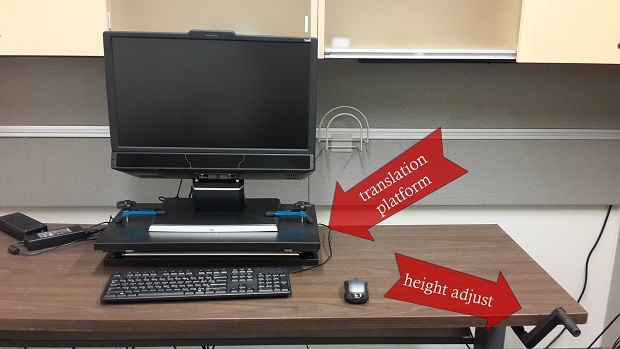 The eye tracking monitor/server is attached to a translating platform that allows the facilitator to accomplish left-right and forward-backward adjustment. The eye tracker and platform sit on a height adjustable table which can be used to change the vertical position of the eye tracker. See photo to the right. 9. For information on operation of Tobii Studio software see the manual or view a walkthrough video.